CAFNEC’s Reinventing Progress: Sustainability Leadership for a New Era conference on April 17th this year was a sellout success. The conference featured an excellent line up of high profile speakers including Professor Ian Lowe, Dr Paul Downton and Professor Peter Newman. Attendees included staff from local and State Government departments, local Councillors and Councillor Candidates, staff and students from JCU as well as business and community leaders. Feedback from attendees was very positive, with reports that the day was inspiring, informative and practical. Maree Grenfell from Cairns Regional Council. The second speaker, Joann Schmider, a Mamu Traditional Owner, offered an Indigenous perspective on sustainability, helping to broaden the horizon of thinking about both sustainability and leadership. leadership for a changing era’. In his characteristic way, Prof. Lowe combined alarming facts about the state of the natural world with a great sense of humour and a hint of optimism to offer a confronting and inspiring overview of the challenges ahead. Following on from this was Kate Harris from the Centre for Sustainability Leadership, with a presentation on what makes a good leader in an uncertain future and what we mean by sustainability leadership. Kate’s message was that we all have the potential to be leaders in this area, and that we can actively develop the skills we need to lead the way. The next session, titled ‘Cutting emissions fast – the nuts and bolts of reducing greenhouse gas emissions’, featured Allan Jones from the City of Sydney, Matthew Wright from Beyond Zero Emissions and Amandine Denis from Climateworks Australia. Allan Jones spoke about the tri-generation work that he is spearheading at City of Sydney, which will see localised gas energy generation at various locations in the city and overall emission reductions. Matthew Wright spoke about the need to move away from gas and to renewable energy sources, and outlined his organisation’s plan for a zero carbon Australia through a combination of solar thermal power plants and wind farms. session lively. Amandine Denis presented research findings about projected emission reductions resulting from current climate policies and how more effective cuts can be made. across the world demonstrating that good planning and innovation can create low-impact, liveable communities. Nikki Huddy presented on how to plan and build healthy cities that promote happiness wellbeing through simple measures such as encouraging active transport and providing space for community activities. Dr Downton spoke about building resilient and sustainable cities, and presented his idea of urban ‘fractals’ as ideal self-sustaining localised ommunities within a city. The final session of the day was a strategic futures workshop looking at what the future holds for our region and how we can position ourselves as leaders in sustainability. This drew on the information from the various sessions throughout the day and encouraged attendees to think strategically about a sustainable future. 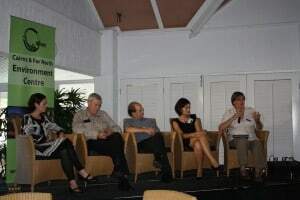 The conference was a great opportunity for local people to hear from the very best of Australia’s sustainability leaders. Given the success of this conference, we look forward to organising similar events in future, so stay tuned for more information. For those who missed it, footage of the conference is available on our website along with the presentation slides from each of the speakers. For information email sustainability@cafnec.org.au or call (07) 4032 1746. 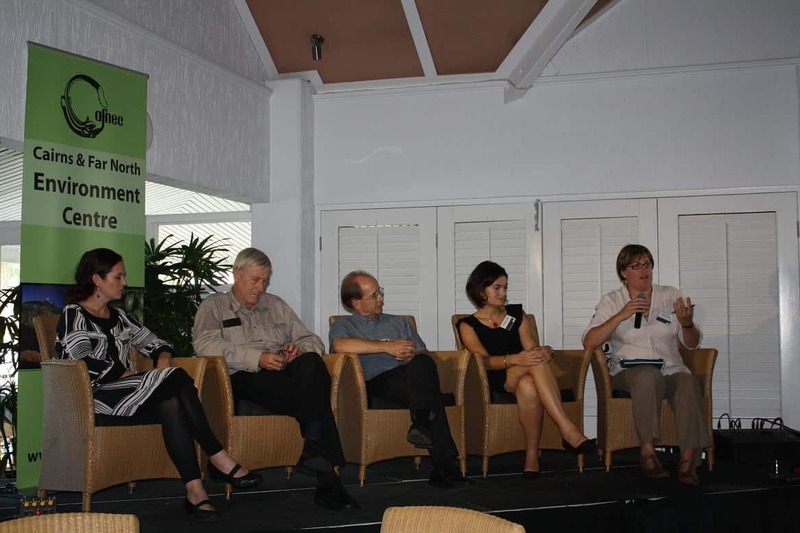 Arup, Regional Development Authority FNQ&TS, The Hotel Cairns, and JCU & TropEco.